Animated activity: Comic book driven films like "Captain America: The Winter Soldier" make big boxoffice headlines, but some of Hollywood's liveliest hits continue to be animated features targeted to families. On the heels of last weekend's $96.2 million launch for "Soldier," 20th Century Fox and Blue Sky Studios' 3D animated G rated adventure comedy "Rio 2" opens Friday at about 3,800 theatres and seems a safe bet to keep April's boxoffice momentum going. Directed by Carlos Saldanha ("Rio"), it stars the voices of Rodrigo Santoro, Anne Hathaway and Leslie Mann. "Rio 2," from the creators of "Ice Age," is tracking best and about equally well with women under and over 25.That's the moms-with-kids audience that typically accounts for a big percentage of an animated film's gross. The franchise's first episode, "Rio," opened Apr. 15, 2011 to $39.2 million. It went on to gross $143.6 million domestically plus about $341 million internationally for a global cume of about $485 million. The grossing potential for 3D animated movies can be quite breathtaking. Disney's PG rated "Frozen," for instance, opened wide last Nov. 27 to $67.4 million and has done $398.9 million in domestic theatres to date. It grossed an additional $674 million internationally for a global cume of about $1.1 billion. This year's top grossing film thus far – summer will change everything, of course -- is Warner Bros. and Legendary Pictures' PG rated 3D animated comedy adventure "The Lego Movie," which after nine weeks in domestic theatres has grossed $250.6 million. It's done another $152 million internationally for a worldwide cume of nearly $403 million. Another recent 3D animated adventure, DreamWorks Animation and Fox's "Mr. Peabody and Sherman," has grossed $102.2 million domestically after five weeks. It's done about $123 million internationally for a global total of about $225 million. "Sherman's" the year's fifth biggest grossing domestic film as of now, but the list will change since "Soldier's" marching through the multiplexes. "Rio 2" or other upcoming 3D animated summer arrivals could crack the year's Top 10 if all goes well. Although Hollywood turns out lots of live action adventures, there aren't as many animated titles battling at the boxoffice. That means they typically have more playing time in theatres before new competition for the same family audience arrives. A case in point is "Rio 2," which won't face new 3D animated competition until DreamWorks Animation and Fox's "How to Train Your Dragon 2" hits theatres June 13. That's a nine week period in which "Rio 2" will be mopping up animated ticket sales. "Dragon 2" stars the voices of Jay Baruchel, Kristen Wiig and America Ferrara and is from "How to Train Your Dragon" director Dean DeBlois. The Story: It's five years since Hiccup and Toothless united dragons and vikings on the island of Berk. When they discover a secret ice cave that's home to hundreds of wild dragons and the mysterious Dragon Rider, the two friends suddenly find themselves in a battle to protect the peace. The original "How to Train Your Dragon" opened Mar. 26, 2010 to $43.7 million via DreamWorks Animation and Paramount and went on to gross $217.6 million domestically. It grossed another $277 million internationally for a global cume of nearly $495 million. A third episode in the franchise is already scheduled for release June 17, 2016 through Fox. 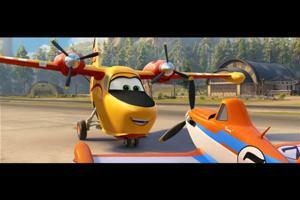 Five weeks after "Dragon 2" checks in, Disney's 3D animated comedy adventure "Planes, Fire & Rescue" lands in theatres July 18. Directed by Bobs Gannaway ("Secret of the Wings"), it stars the voices of Dane Cook, Julie Bowen and Ed Harris. While it's an original story, "Planes" should benefit from being in the tradition of Disney animated features that have brought objects like cars to life on the screen. The Story: When world-famous air racer Dusty (Cook) learns his engine's damaged and he may never race again, he must shift gears and is launched into the world of aerial firefighting. Dusty joins forces with veteran fire and rescue helicopter Blade Ranger (Harris) and The Smokejumpers, his team of all-terrain vehicles. Together, the fearless team battles a massive wildfire, and Dusty learns what it takes to become a true hero. Bottom line:Families looking for 3D animated adventures this summer will have some familiar high profile titles to keep their kids happy.